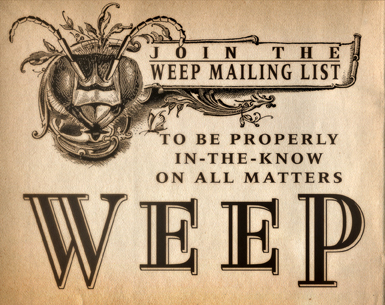 Join the Weep mailing list for all things WEEP. What started out as a band tinkering around with the idea with making a dance mix for a New York club night, has turned into this unique collection of unrequested and unprecedented songs. “I had no idea that this would work as well as it did. I mean, we’re not a huge fans of dance music. I guess that’s what made us want to do this; a rock band that loves the old Tommy Boy Records sound, and loves old Depeche Mode and stuff like that are probably the best candidates for making a unique dance recording. Ya know? We got nothing to lose! Nobody expects us to do this…” says leader, Doc Hammer. Each song has been completely rerecorded into a dance (or lumbering New Wave, or sentimental prom theme) interpretation of the original track from both WORN THIN and NEVER EVER. Unlike most “remix” CD’s, 6 INTERPRETATIONS was created by the band that recorded the original songs, therefore, this collection is more than a bunch of songs that have a louder snare drum, and an extended chorus . It’s a wacky little concept CD of intentionally dated and sometimes hilariously accurate dance rhythms, and feel-good grooves of a time when the 12″ Club Mix ruled the dance floor. 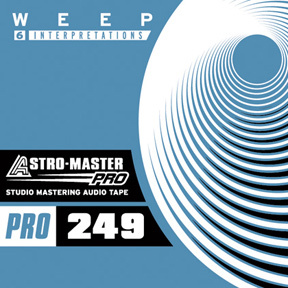 A must for Weep collectors, DJ’s that are tired of the same old thing, and people that love to annoy their neighbors with really loud dance music. WEEP is the project of Doc Hammer, best known in Europe as founding member of goth darlings REQUIEM IN WHITE and MORS SYPHILITICA, famous in the United States as co-creator of ‘Cartoon Network’s THE VENTURE BROS.